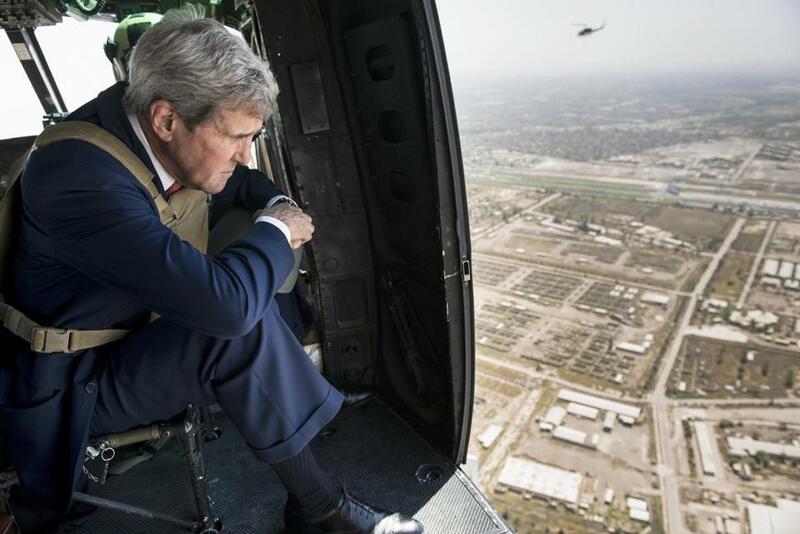 Secretary of State John Kerry looked over Baghdad from a helicopter on Sept. 10. When Barack Obama ran for reelection in 2012 he enjoyed a political gift that no Democrat had experienced in decades — he held a clear advantage on foreign policy and national security. Part of the reason was that America was at peace, its major wars in the Middle East had ended or were winding down, and, oh yeah, he killed Osama bin Laden. In fact, Obama’s handling of international terrorism earned higher marks from the public than his handling of any other policy issue. A lot has changed in two years. According to a recent Gallup poll, Americans believe that Republicans are better able to protect the United States from terrorism and other international threats by a 55-to-32 margin. That’s their biggest lead on this issue since 2002. It’s an extraordinary reversal of fortune, and it’s one that is hard to fathom when you consider how much better President Obama has handled national security than Republicans. That’s not just my opinion; it’s a view shared by most Americans, who turned against President Bush for the disastrous Iraq War and have largely supported Obama’s counterterrorism efforts. Since taking office, Obama has devastated Al Qaeda’s leadership; he’s taken the fight to Yemen, Somalia and Pakistan (in a manner that has been both constitutionally dubious and morally fraught); he ended the war in Iraq; and he drew down in Afghanistan (after disastrously expanding the war initially). That’s a pretty good track record; still, the operating principle for a majority of Americans seems to be: What have you done for me lately? With Americans believing the direct threat from ISIS is real (it isn’t, according to the US intelligence community) and pundits repeatedly claiming that Obama’s sluggishness has led to its rise, combined with the beheadings of journalists and aid workers as well as flare-ups in other international hot spots, it’s not surprising that his poll numbers would suffer. The president is being held responsible for the world’s problems and for the public’s zero tolerance when it comes to terrorism. But these numbers also speak to the frustrating incoherence of voters when it comes to foreign policy. For example, a Pew Research Center poll last year showed that 52 percent of Americans agree that the United States should “mind its own business internationally” — the highest level in 50 years. One might conclude from this that Americans want the United States to pull up the drawbridge and come home. But not so fast, because at the same time, Americans strongly support the United States playing an active role in global affairs and, as Obama can attest, blame the president for international bad news and expect him to respond. Quite simply, Americans want the United States to stop being the world’ s policeman, but they also don’t want to surrender the role of global leader. This incoherence masks another deeper and more important political reality about global affairs — Americans are increasingly checked out. As pollster Jeremy Rosner said to me, “don’t pay attention to the polls,” which might seem like an odd thing for a pollster to say. In his view, the public’s desire to back away from the world is more a reflection of apathy about foreign affairs than an actual yearning for real policy shifts. If the alarmist headlines — and beheading videos — disappear and no American boots end up on Iraqi ground, Obama’s numbers could very likely shoot back up. All of this has political implications for November and beyond. There is no congressional campaign where national security is playing a prominent role. You could probably count on one hand the number of foreign policy-related ads running this cycle. Americans simply aren’t interested — and barring a major war or terrorist attack, that is unlikely to change between now and 2016. That is bad news for potential presidential candidates, including Republican Rand Paul and, oddly, Democrat Hillary Clinton, who might be in for a surprise if she wants to run on her foreign policy experience. While it has seemed for the past 13 years that terrorism and war has dominated American politics, this is not only a bit of an exaggeration but it’s likely an outlier. The new normal on foreign policy is indifference.